The RS-25 test team at Stennis Space Center hot-fired an untested flight engine on the A-1 Test Stand Thursday to help complete certification of design changes to fly on the Space Launch System (SLS). The test is another step towards the flagship test firing of all four engines on the B-2 Test Stand. Engine 2063 was assembled at Stennis from the hardware inventory inherited from the Space Shuttle Program. It was installed in the A-1 test stand at the end of September to begin final preparations for the eight-minute long firing, which also serves as the acceptance test for the new engine. 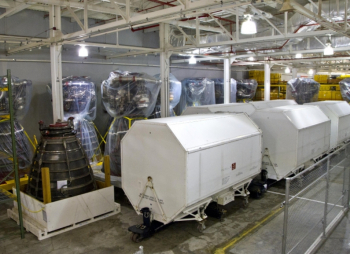 The test marked one of the final requirements for certifying the SLS launch environment for the engines along with modern replacement computer hardware and software. As adaptation of the former Space Shuttle Main Engine (SSME) design to the RS-25 is nearing completion, the four engines that will fly on the first SLS launch, Exploration Mission-1 (EM-1), are assembled and ready for integration, hopefully sometime next year. The test team of personnel from NASA, RS-25 prime contractor Aerojet Rocketdyne, and Stennis facilities contractor Syncom Space Services (S3) conducted the countdown and hot-fire. 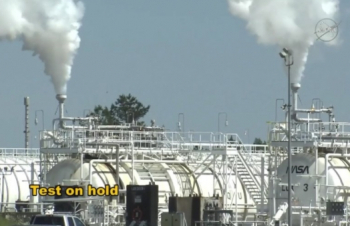 The test team at Stennis was again using the more typical event-driven approach. When all of the prerequisite steps prior to ignition are complete and the hardware and the people are ready, the test started. 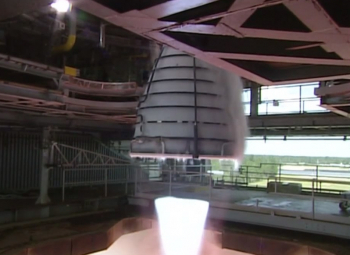 “The test that we’re planning to run on Thursday is a 500-second duration test, which is typical of what we’ve done in the past, it’s representative of a nominal SLS profile,” Philip Benefield, Systems and Requirements Team Lead for the SLS Liquid Engines Office, said ahead of the test. The firing took place at 2:55pm local Central Time. E2063 is one of two unflown, untested flight units in the engine hardware inventory inherited by SLS from the Space Shuttle Program; the engine is currently assigned to fly on the second SLS Core Stage. Primary objectives of the test-firing are to acceptance test the “new” engine and help certify the new engine control system by demonstrating that it works with a flight engine. 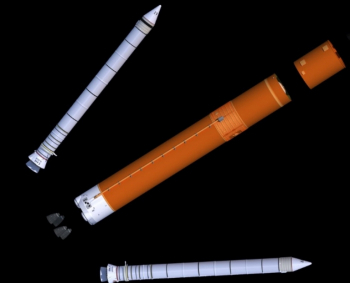 “In terms of what we’ve stated that we need to demonstrate on the ground, through our ground test program with the different development engines to certify the design is ready for SLS, Thursday’s test is it,” he noted. 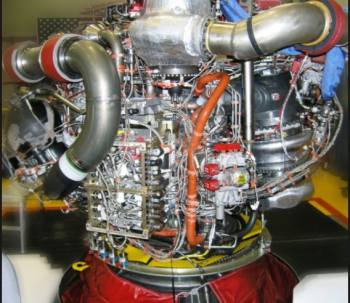 Another primary goal is to acceptance test or “green run” several major engine components, including the FM8 engine controller unit (ECU), the engine nozzle, and both high-pressure turbopumps. During the 500-second long test firing, the engine was throttled at thrust levels from 80 percent to 109 percent of rated power level (RPL). The engine was throttled at 109 percent RPL for 350 seconds, at 100 percent RPL for eight seconds, and at 80 percent RPL for 78 seconds. Although the integrated engine is tested as a unit, the green run of the engine and the components are separate objectives in the test. “The engine is made up of a lot of components; two of the primary components are the powerhead and the main [combustion] chamber,” Benefield explained. “When we put those two components together we basically define that as ‘you’ve made an engine now.’ You can add a lot of LRUs (line-replaceable units) to it — different pumps, different valves, different ducts, and so forth, but that combination of a powerhead and a chamber really [defines] the engine and we want to measure the performance of that system. 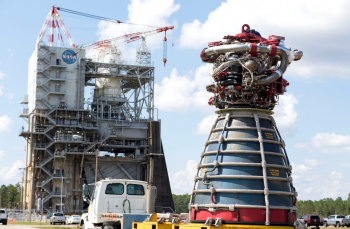 The last of the sixteen units to be completed, E2063 was assembled over an approximately three month period in Aerojet Rocketdyne’s facility in Building 9101 at Stennis, with major assembly completed in 2015. Although E2063 is not planned to fly until the second SLS launch, all four of those second-flight engines will also serve as spares for the EM-1 inaugural flight. “We want to have them ready before EM-1 is ready to fly in case we have an issue on the pad and we have to change out engines and we have that set ready to go in,” Benefield noted. The “heritage” SSME hardware and its Shuttle-era, reusable design was adapted for use in the SLS Core Stage. The resulting “adaptation” version of the engine, now going by its RS-25 designation, will fly a final launch in sets of four on the expendable launch vehicle. 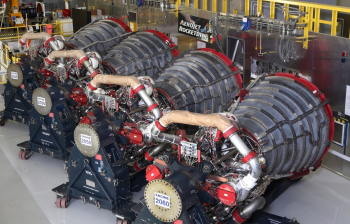 Although largely the same engine design and hardware, the RS-25 adaptation engines integrated a new control system for use on SLS, which includes new engine controller hardware and software. More than two and a half years of ground testing across seventeen hot-fire tests have helped demonstrate and qualify the new control system and have tested the engines under SLS flight conditions. For SLS, the engines operate at higher pressures and higher thrust than on Shuttle, and the liquid hydrogen and liquid oxygen propellant is also fed to them at colder temperatures. Integration of the engines with the SLS Core Stage and the overall launch vehicle, which also includes two solid rocket boosters larger than the ones used on Shuttle, will also bring other operational and environmental changes for the engines both before and during flight, including areas like ascent thermal heating and propellant management. 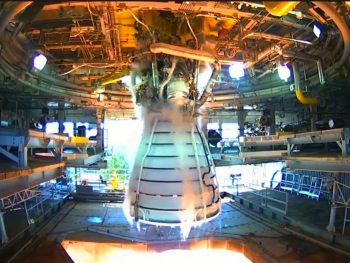 This eighteenth RS-25 hot-fire test for SLS was the second test of a flight SLS Core Stage engine; the first was performed on E2059 in March, 2016. The E2059 test in 2016 satisfied an earlier certification program objective of establishing run-time on a flight engine, although using an earlier engineering model of the ECU. This second flight engine test serves as one of the final test objectives in the certification program for the planned adaptation engine flight design. “The [engine] 2063 test is the last one required for us to get certification for first flight. Actually, honestly for the first four flights — [the certification] covers all the adaptation engines, which is the sixteen engines that we have for the first four flights,” Benefield said. Many of the recent hot-fire tests are using aspects of the throttle profile that is planned for the first SLS launches. During a recent interview, Benefield explained the throttle profile from a graph of the most recent hot-fire test on August 30. The heritage SSME design and the RS-25 adaptation engines throttle down lower than 80 percent in flight, but that’s as far as the hot-fire tests can go at sea-level today. “For a ground test without a diffuser, which is what we have on the A-1 test stand, you can’t throttle that low because the nozzle flow separates and it would damage the nozzle,” Benefield explained. “So we can only throttle down to 80 percent on the ground if we needed to throttle lower than 80 percent, we’d have to go back to a stand like A-2 that has a diffuser.” Both the A-1 and A-2 test stands were used for single engine hot-fire tests during Shuttle. 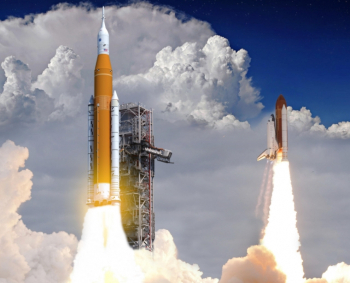 Aerojet Rocketdyne is working with NASA to make further changes to the RS-25 design for SLS flights beyond the first four. The changes are primarily aimed at reductions in the cost of production, but will also incorporate operational requirements changes. That evolution from the adaptation engines is called the “production restart” engine. One of the changes planned for the production restart engine is the higher minimum power level. “For the adaptation engine, our requirements are to operate between 65 percent and 109 percent, which is the same range that we had for Shuttle,” Benefield explained. “In Shuttle, we only flew at 104 and a half, but we had the capability to go up to 109 for an abort. So for adaptation engine, our [minimum] requirement is 65 percent.” He noted that current launch trajectory design work is only taking the engines down to 67 percent. “For our production restart engines, the requirement is 80 percent minimum and 111 percent maximum,” he continued. “We changed the minimum for the production restart [for] two reasons. 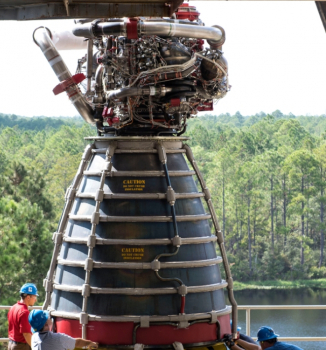 Most of the RS-25 hot-fire tests at Stennis this year have green run flight model ECUs as they have come off the Honeywell production line at their Clearwater, Florida facility. The last test on August 30 was a green run of the FM7 controller using development engine 0528 and completed the set of four controllers that are installed on the flight engines that will be integrated with the first Core Stage (CS-1). Originally, the next four controllers (FM2 through FM5) were assigned to the flight engines, and FM3 was green run earlier in the year; however, issues with both FM3 and FM4 have moved those units down the production line and they will be tested when they have passed their acceptance test procedures (ATP). “FM3 went back [to Honeywell] for an inspection [after its green run]; when they re-assembled the unit and took it through its ATP it had an issue that they had to troubleshoot and ended up changing a board, so they had to put it back in the green run mix,” Benefield noted. Similar issues with the acceptance of the flight model controllers delayed the start of deliveries until early this year. For the first SLS launch on EM-1, E2045 will fly with FM2 in position 1 on CS-1, E2056 with FM6 in position 2, E2058 with FM5 in position 3, and E2060 with FM7 in position 4. 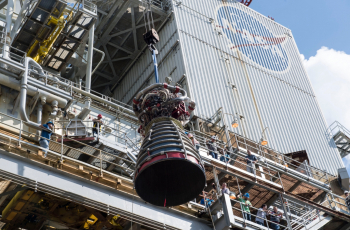 Work to integrate the new ECUs with the flight engines was recently completed at Aerojet Rocketdyne’s facility at Stennis, and the four first-flight engines are basically ready to be installed when the time comes. For now, plans are for the engines to remain at Stennis until next Spring; when assembly of the first Core Stage (CS-1) reaches the point where the engines can be installed, they will make the relatively short trip to the Michoud Assembly Facility (MAF) in New Orleans where CS-1 is under construction. Before that, a Pathfinder engine will ship to MAF in a few weeks. The Pathfinder engine is a Shuttle-era SSME and includes powerhead 2107; in its original configuration as powerhead 2007, it flew as one of the foundational elements of engine 2007 on the first five Space Shuttle flights in 1981 and 1982. In the meantime, E0528 will return to the A-1 stand after this test to continue green runs of new engine controllers. The next ECU green run test using E0528 is currently planned for January. Notes from L2 indicate that ECU green runs will continue next year to accept controllers that will fly in engines on the second, third, and fourth Core Stages. After a break in the Spring, development engine 0525 will replace E0528 in the A-1 stand to serve as the host for those tests.